I am an Italian Tenor and I started my vocal training with renowned bass Alfredo Mariotti. I graduated in Singing in 2009 at the Conservatorio “Tomadini” in Udine and in Piano in 2008 at the Conservatorio "Frescobaldi" in Ferrara. I won two editions of the Concorso Cameristico C.A.Seghizzi in Gorizia: in 2005 in Sacred Music category, and in 2007 in Chamber Singing category (in duo with Alessandro Sica, with whom I attended a masterclass with soprano Catherine Dubosc). As an opera singer I have performed the following roles: Alfredo (Traviata, Verdi), Count Almaviva (Barbiere di Siviglia, Rossini) Ernesto (Don Pasquale, Donizetti), Nemorino (Elisir d’Amore, Donizetti), Pinkerton (Madama Butterfly, Puccini), Pong (Turandot, Puccini), Jacopo Foscari (I due Foscari, Verdi), Edgardo (Lucia di Lammermoor, Donizetti), Hoffmann (Les Contes d’Hoffmann, Offenbach). I took part in the Rai Italian Television productions of Rigoletto (2010) conducted by Zubin Mehta with Placido Domingo in the title-role and Cenerentola (2012), conducted by Gianluigi Gelmetti. As a chamber music singer I performed several times Schubert`s and Schumann`s most important Lieder cycles, beside works by composers like Haydn, Beethoven, Brahms, Liszt, Mahler, Strauss, Berg, Fauré, Duparc, Ravel, Poulenc, Rachmaninov, Britten, Copland… in duo with pianists Alberto Miodini, Michele Bravin, David Giovanni Leonardi, Federico Lovato and with Trio di Parma. As a concert singer I performed the solo roles in Requiem by Mozart (with Orchestra Filarmonica della Fenice, Venice, conducted by Enrico Bronzi), Liszt (with Chorus and Orchestra of Teatro Verdi, Trieste, conducted by Armando Tasso), Dvořak and Verdi, in Haydn`s Missa in Tempore Belli (conducted by Antonio Ballista), Rossini`s Petite Messe Solennelle and in Orff`s Carmina Burana in many italian houses and halls (such as Teatro Comunale di Bologna Teatro Civico di Castello in Cagliari), in Austria, Croatia, Czech Republic and Russia. I recorded for Tactus records some composition for tenor and organ by Marco Enrico Bossi with organist Andrea Macinanti. 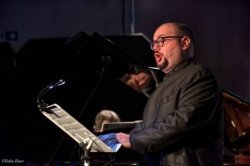 In 2012 and 2014 he gave two cycles of lectures opened to general public: the first one about opera history and the second about vocal chamber music history. ClaudiaFrom Angela (5/5): Claudia is always prepared when we arrive and goes above and beyond in her lessons with our five year old daughter. She loves Claudia and always looks forward to her lessons with her.